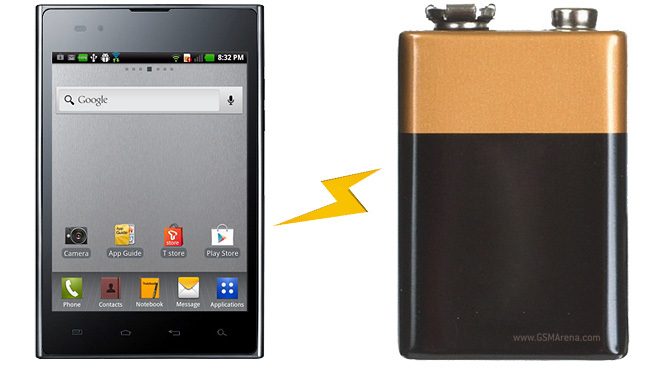 LG Optimus Vu is almost a tablet, but it has voice calling functionality and qualifies for our full battery test. It’s a big device, so there’s room for a big battery but there’s also a big huge power-hungry screen to consider – let’s see how these two things balance each other out. It’s a little disappointing to find out that the Optimus Vu has only a 2080mAh battery – even the 4X HD had a 2150 mAh juice pack. 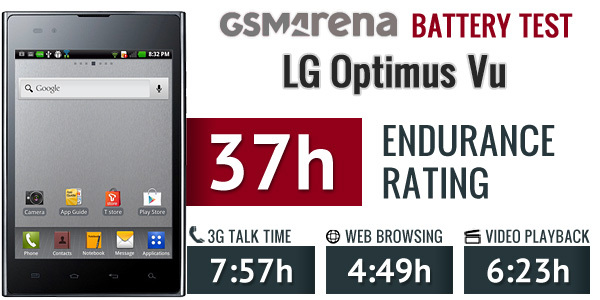 The LG Optimus Vu can go for a bit under 8 hours of voice calls over a 3G network. That’s not bad and the Vu is unlikely to be your primary calling device. Still, the Samsung Galaxy Note went for over 12 hours (in part thanks to the bigger, 2500mAh battery). Web browsing is one area where the Optimus Vu has a chance to beat its nemesis – AMOLED screens have really bad energy efficiency at displaying white web pages. And while it does beat the Note by over an hour the result is only average if you consider all phones we’ve tested. The video playback also came back average. At over 6 hours, you still have time to watch several full-length movies, but when you consider the 4:3 screen the LG Optimus Vu just doesn’t come off as a portable video player. Our final endurance rating is 37 hours. That’s less than the Optimus 4X HD got, but the Optimus Vu eats more battery in standby (with Wi-Fi and sync on), which reduced the time you can spend in between charging the phoneblet. According to LG the 4:3 aspect ratio of the screen is better suited for reading web pages – and if we’re talking non-mobile sites, we’re inclined to agree. But the Optimus Vu lasts only about 5 hours of browsing (that’s if you do nothing else), so you might want to hold off on watching videos on the device (watching letterboxed 16:9 videos isn’t ideal anyway).